Complex NPK BIOINORGANIC fertilizer. Results from the combination of inorganic nutrients (Ν-Ρ2Ο5-Κ2O-S ) with large Organic Matter molecules (humic complexes). Humic complexes contain substances with a direct effect on the culture. They trigger root system growth, promote flowering and fruition and improve the organoleptic properties of the crop. At the same time, they function as activators of soil's physicochemical properties; they alter the nutrients mobility and increase their availability to the culture. 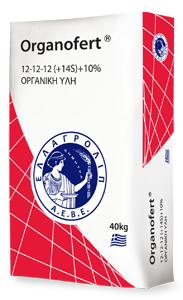 Organofert 12 - 12 - 12 ( + 14S ) + 10% O.M. constitutes a unique choice for the basic fertilization of all culture types without exception, and specifically arboriculture, viticulture and modern horticulture. It leads to an impressive yield increase and improves the qualitative characteristics of the crop.